We’re on a Roll today, thanks to these folks like Tami who spend time trying to find the lovies I post about!!!! Now we know for sure that this is a 2005 Animal Adventure Duck, in case anyone else wants one sometime in the future. Thank you so much for your help with finding Pilar. You have an amazing ministry going. Alex was able to purchase one of the ducks off of ebay from one of the two people who emailed me with tips, after you posted our request on the Dirty Butter site. Many people have ministries that provide help with food, clothing and furniture which are so essential, but your ministry heals the heart. You are to be blessed. Thank you for your willingness to help search for our lost duck. My 26 year son moved to China in August of 2007 to study Chinese for three years. Prior to leaving the States he entrusted his Pooh Bear, that he has had since his birth over 26 years ago to his girlfriend. In turn, she gave him Pilar, a small beanie type duck her mother had given her on Easter of 2007 to take with him to China, as this duck had become important to them in their relationship. In the one year that my son has lived in China he has moved four times and during the last move Pilar was lost. He has contacted everyone at his school that might have seen the duck or could have found it, with no success. Though he still continues to look for Pilar, he accepts the fact she may never be found and now hopes to locate an identical replacement. I do not know the brand of the duck but I do have a photo which I am enclosing. The duck is a light yellow. Also, the plush is not your common plush, as it is not as fine as what you find on most stuffed animals, but more like a cross between regular plush and soft clipped terry cloth. My son says she was probably purchased around Easter 2007 at a store in Steven’s Point, WI and originally had an orange ribbon around her neck. Any help in finding an identical duck, or providing brand information, etc. would be very helpful and much appreciated. Thank you all so very much. 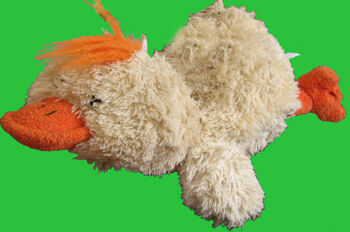 If you can help Judy find this Light Yellow Beanie Chenille Duck, THIS SITE IS NO LONGER ACTIVELY MANAGED. Please use Our FREE FACEBOOK GROUP, including #091108-5 in the subject, . I mean animal adventure duck? I’ve sent them off, so we will see. I hope you see this Tami. She sent a beautiful thank you note that I have added to the top of the post. I just love helping others find their lovies! I love the way she worded it, don’t you?? Makes me warm all over. I did get the goosebumps, cause it made me feel good.